Dry conditions can lead to guitar damage. A guitar humidifier will protect your Taylor and keep it playing and sounding its best. Taylor guitars are built in a controlled environment where the relative humidity is 46 percent. It is essential to maintain a proper moisture level to prevent the adverse effects of dry conditions, such as bad string action and buzzing, protruding fret ends, wood cracking, top sinking, bridge lifting, and other damage to your instrument. 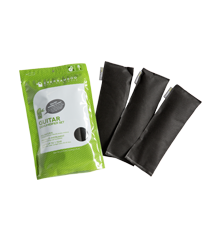 As always, your guitar case provides essential protection from drying and other environmental effects, but in areas prone to severe dryness and/or cold (such as heated homes), you must use a guitar-humidifying device. There are several stringed-instrument humidifiers on the market that are specifically designed to maintain or restore the proper moisture level. These include the D’Addario Two-Way Humidification System®, and the Oasis OH-1, both of which we recommend and sell through TaylorWare® at taylorguitars.com. The Two-Way Humidification kit includes three packets and two pouches. The soundhole pouch houses two packets and is draped over the strings, allowing both pouch compartments to descend into the soundhole to maintain the RH of the guitar body. If you have room in the case (e.g., in the cutaway area), you can place the pouches there instead. The headstock pouch, which holds the third packet, is placed beneath the headstock in the case to help maintain the neck and fretboard. No harmful chemicals are used; it’s just salt and pure water, and only pure water vapor is allowed in and out of the packet. The packets are designed to be tear- and puncture-resistant, and to be completely resistant to leakage. Depending on climate conditions, they should last from two to six months, after which they can simply be discarded. It’s time for a new set when the packets become solid and the contents can’t be moved around with your fingers. An effective option for rehumidifying a dry guitar and maintaining good humidity levels in dry climates is the Oasis® Humidifier, which features a watertight container with a specially designed fabric for water vapor to pass through. MusicNomad’s Case Humitar is another excellent option that holds a lot of water safely away from the soundhole. Avoid humidifiers that seal off the soundhole, unless you use a secondary humidifier behind the peghead. The guitar’s neck also needs that moisture and could be damaged if all the water vapor is trapped inside the body. How often should I re-wet my water-based humidifier? That depends on the season and the region in which you live. Using a digital hygrometer to monitor the humidity level inside the case is the only way to be certain you’re in the 45-55% range. If you’re having trouble getting the reading up to that range, rewet the humidifier more frequently and add a second or larger humidifier inside the case. To monitor the amount of humidity your guitar is receiving, we recommend the purchase of a digital hygrometer, a device that gauges and provides a read-out of humidity levels. In our experience, analog or needle-style models fall out of calibration easily or the needle gets stuck in place and can’t be trusted. 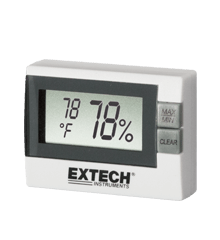 You can find a good digital hygrometer through your local music stores, TaylorWare® at taylorguitars.com, Amazon.com, or other online retailers. It can be kept in the room where you store your guitars, or, better yet, in a central location inside the guitar case, preferably Velcro’d to the outside of the accessories compartment (facing the heel of the guitar). The optimal range for your guitar is 45-55% RH.